The H2020 BlueBRIDGE project shares the commitment and for this reason it launched its Competitive Call for SMEs designed to support small and medium enterprises in improving their data management practices thus paving the way for enhanced data products and services. The 4 winners of the call AquaBioTech Group, Flyby, Sinay and StatnMap were selected based on strict criteria, prioritizing the business growth potential for the blue sector all 4 winning companies belong to. The objective of the call is to empower 4 European SMEs working on collaborative data management for the fisheries, marine, environmental & ecological domains or in the aquaculture sector by providing them access to the BlueBRIDGE resources (datasets, services and technologies and data analytics). The support offered by BlueBRIDGE will help SMEs to solve data management issues, to improve their existing services or technologies and to enhance their portfolio through the development of new services. As the Call for SMEs was not foreseen in the original budget of the BlueBRIDGE project, no financial support has been offered through the call. This makes the results of the Call even more relevant. 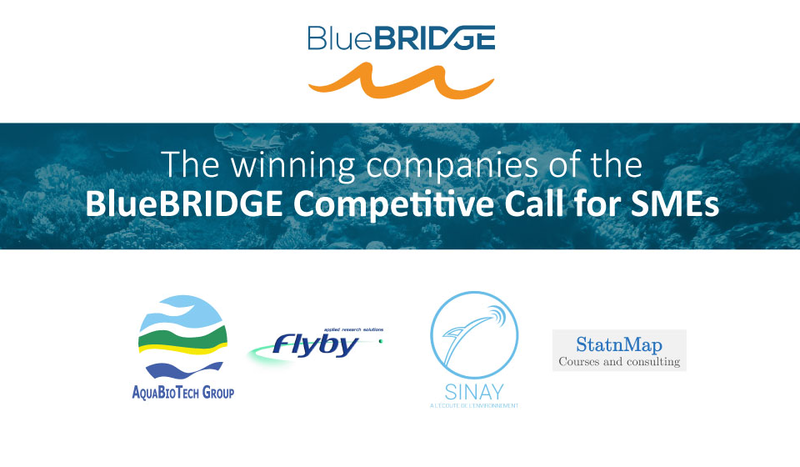 In June 2017, the BlueBRIDGE evaluation committee, composed by experts in computer science and in data management applied to ecosystem approach to fisheries and aquaculture, reviewed the applications received and selected the 4 winning companies. The evaluation was based on 4 main criteria focusing on the one hand on the specific problem the SMEs are facing, how the use of BlueBRIDGE resources impacts the growth/innovation/business/service of the companies, the long-term exploitation potential and sustainability while promoting Open Access to the data and results generated on the other hand. As a first step in the collaboration, BlueBRIDGE set up 2 Virtual Research Environments - VREs, web-based applications fully equipped with the necessary resources, allowing AquaBioTech and StatnMap to start using the BlueBRIDGE services already in the summer period. The remaining three VREs are planned to be set up in September 2017 as further requirements analysis is performed over the upcoming months.